In a typical product training session, marketers gather salespeople in a room for a day or two, and some time later later they walk out bleary-eyed, shell-shocked and looking for a few stiff drinks after a long line of presenters has bombarded them with PowerPoint slide presentations on the latest and greatest products, features, functions and benefits. They’re lucky if they retain 10% of what was presented after 30 days. Sales enablement and training is all too often non-interactive, but more importantly, non-actionable. Is there a “call to action” and clear next steps for what the salesperson should do the very next day following the training? immediately engage buyers and qualify more effectively to generate pipeline, revenue and quota achievement? Admarco’s core competency is changing the sales culture of an organization. Inspiring them to convey their organization’s message and value proposition in an immersive whiteboard storytelling training session. Participants learn storytelling technique and how to draw and explain a whiteboard or a visual confection that tells a story, whether in person or over the phone in a confident, compelling and consistent fashion. 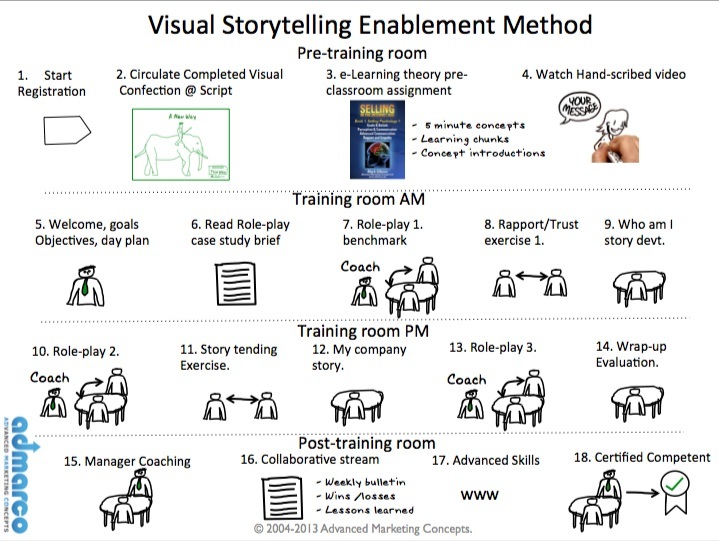 Training and coaching individuals, their sales management and enablement teams in best-practices technique for selling with visual storytelling.